Ancient Greek philosophers first developed the idea that all matter is composed of invisible particles called atoms. The word atom comes from the Greek word, atomos, meaning indivisible. Scientists in the 18th and 19th centuries revised the concept based on their experiments. By 1900, physicists knew the atom contains large quantities of energy. 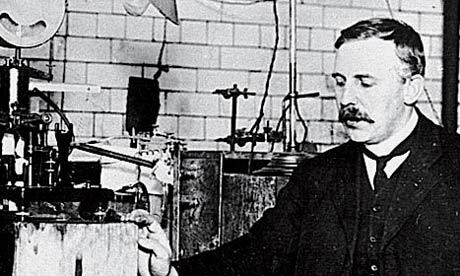 British physicist Ernest Rutherford was called the father of nuclear science because of his contribution to the theory of atomic structure. In 1904 he wrote: "If it were ever possible to control at will the rate of disintegration of the radio elements, an enormous amount of energy could be obtained from a small amount of matter." Albert Einstein developed his theory of the relationship between mass and energy one year later. 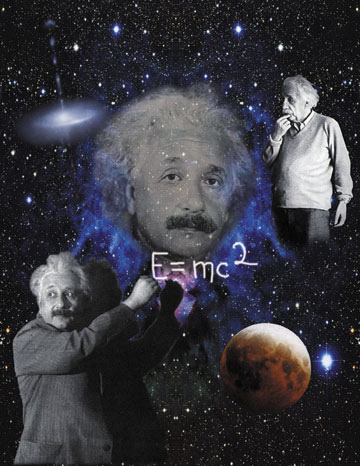 The mathematical formula is E=mc 2, or “energy equals mass times the speed of light squared.” It took almost 35 years for someone to prove Einstein’s theory. Although they are tiny, atoms have a large amount of energy holding their nuclei together. Certain isotopes of some elements can be split and will release part of their energy as heat. This splitting is called fission. The heat released in fission can be used to help generate electricity in powerplants. Uranium-235 (U-235) is one of the isotopes that fissions easily. During fission, U-235 atoms absorb loose neutrons. This causes U-235 to become unstable and split into two light atoms called fission products. The combined mass of the fission products is less than that of the original U-235. The reduction occurs because some of the matter changes into energy. The energy is released as heat. Two or three neutrons are released along with the heat. These neutrons may hit other atoms, causing more fission. A series of fissions is called a chain reaction. If enough uranium is brought together under the right conditions, a continuous chain reaction occurs. This is called a self-sustaining chain reaction. A self-sustaining chain reaction creates a great deal of heat, which can be used to help generate electricity. Nuclear powerplants generate electricity like any other steam-electric powerplant. Water is heated, and steam from the boiling water turns turbines and generates electricity. The main difference in the various types of steam-electric plants is the heat source. Heat from a selfsustaining chain reaction boils the water in a nuclear powerplant. Coal, oil, or gas is burned in other powerplants to heat the water. In 1934, physicist Enrico Fermi conducted experiments in Rome that showed neutrons could split many kinds of atoms. The results surprised even Fermi himself. When he bombarded uranium with neutrons, he did not get the elements he expected. The elements were much lighter than uranium. In the fall of 1938, German scientists Otto Hahn and Fritz Strassman fired neutrons from a source containing the elements radium and beryllium into uranium (atomic number 92). They were surprised to find lighter elements, such as barium (atomic number 56), in the leftover materials. These elements had about half the atomic mass of uranium. In previous experiments, the leftover materials were only slightly lighter than uranium. 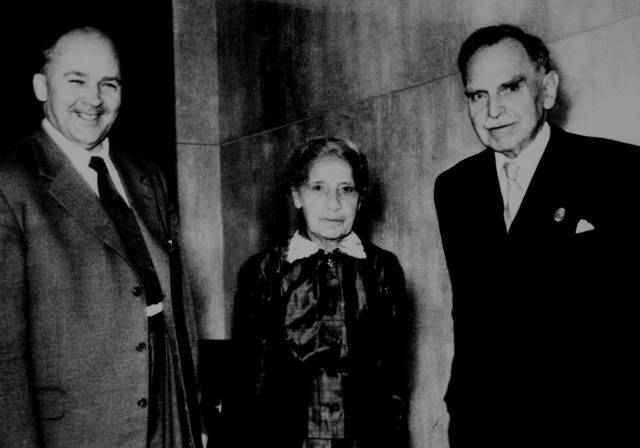 Hahn and Strassman contacted Lise Meitner in Copenhagen before publicizing their discovery. She was an Austrian colleague who had been forced to flee Nazi Germany. She worked with Niels Bohr and her nephew, Otto R. Frisch. Meitner and Frisch thought the barium and other light elements in the leftover material resulted from the uranium splitting — or fissioning. However, when she added the atomic masses of the fission products, they did not total the uranium’s mass. Meitner used Einstein’s theory to show the lost mass changed to energy. This proved fission occurred and confirmed Einstein’s work. In 1939, Bohr came to America. He shared with Einstein the Hahn-Strassman-Meitner discoveries. Bohr also met Fermi at a conference on theoretical physics in Washington, D.C. They discussed the exciting possibility of a selfsustaining chain reaction. In such a process, atoms could be split to release large amounts of energy. Scientists throughout the world began to believe a self-sustaining chain reaction might be possible. It would happen if enough uranium could be brought together under proper conditions. The amount of uranium needed to make a self-sustaining chain reaction is called a critical mass. Fermi and his associate, Leo Szilard, suggested a possible design for a uranium chain reactor in 1941. Their model consisted of uranium placed in a stack of graphite to make a cube-like frame of fissionable material. Early in 1942, a group of scientists led by Fermi gathered at the University of Chicago to develop their theories. By November 1942, they were ready for construction to begin on the world’s first nuclear reactor, which became known as Chicago Pile-1. The pile was erected on the floor of a squash court beneath the University of Chicago’s athletic stadium. In addition to uranium and graphite, it contained control rods made of cadmium. Cadmium is a metallic element that absorbs neutrons. When the rods were in the pile, there were fewer neutrons to fission uranium atoms. This slowed the chain reaction. When the rods were pulled out, more neutrons were available to split atoms. The chain reaction sped up. On the morning of December 2, 1942, the scientists were ready to begin a demonstration of Chicago Pile-1. Fermi ordered the control rods to be withdrawn a few inches at a time during the next several hours. Finally, at 3:25 p.m., Chicago time, the nuclear reaction became self-sustaining. Fermi and his group had successfully transformed scientific theory into technological reality. The world had entered the nuclear age. The first nuclear reactor was only the beginning. 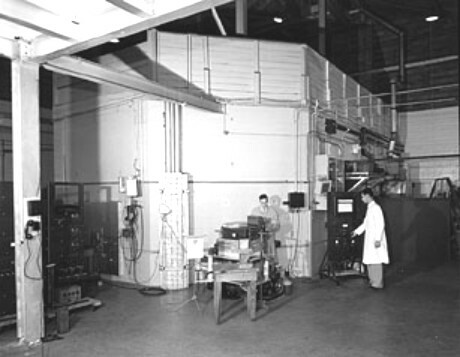 Most early atomic research focused on developing an effective weapon for use in World War II. The work was done under the code name Manhattan Project. However, some scientists worked on making breeder reactors, which would produce fissionable material in the chain reaction. Therefore, they would create more fissionable material than they would use. After the war, the United States government encouraged the development of nuclear energy for peaceful civilian purposes. Congress created the Atomic Energy Commission (AEC) in 1946. 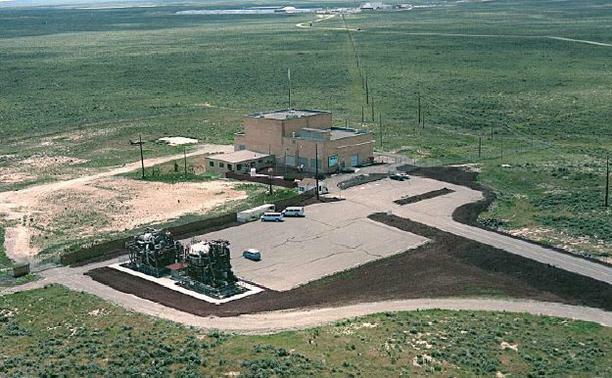 The AEC authorized the construction of Experimental Breeder Reactor I at a site in Idaho. The reactor generated the first electricity from nuclear energy on December 20, 1951. Enrico Fermi led a group of scientists in initiating the first selfsustaining nuclear chain reaction. A major goal of nuclear research in the mid-1950s was to show that nuclear energy could produce electricity for commercial use. The first commercial electricity-generating plant powered by nuclear energy was located in Shippingport, Pennsylvania. It reached its full design power in 1957. Light-water reactors like Shippingport use ordinary water to cool the reactor core during the chain reaction. They were the best design then available for nuclear powerplants. 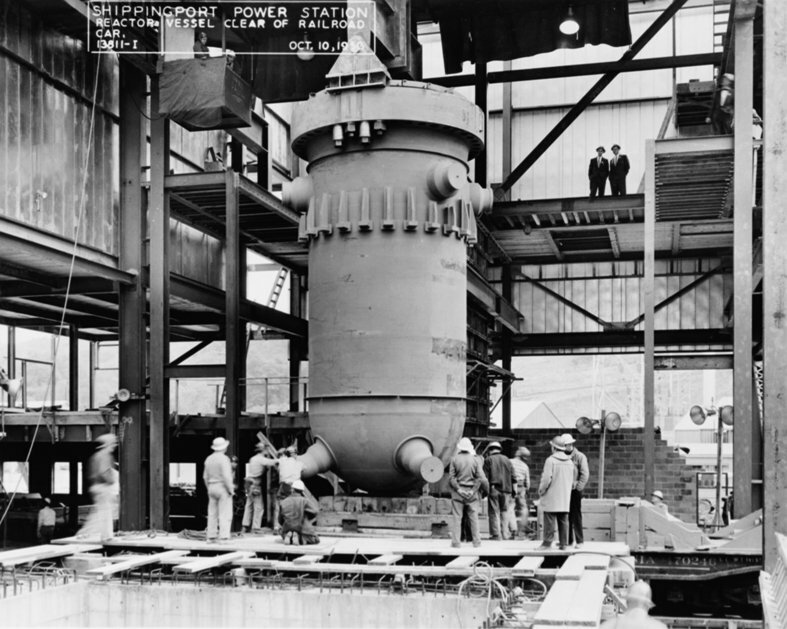 Private industry became more and more involved in developing light-water reactors after Shippingport became operational Federal nuclear energy programs shifted their focus to developing other reactor technologies. The nuclear power industry in the U.S. grew rapidly in the 1960s. Utility companies saw this new form of electricity production as economical, environmentally clean, and safe. In the 1970s and 1980s, however, growth slowed. Demand for electricity decreased and concern grew over nuclear issues, such as reactor safety, waste disposal, and other environmental considerations. Still, the U.S. had twice as many operating nuclear powerplants as any other country in 1991. This was more than one-fourth of the world’s operating plants. Nuclear energy supplied almost 22 percent of the electricity produced in the U.S.
To establish an effective high-level nuclear waste disposal program. Several of these nuclear power goals were addressed in the Energy Policy Act of 1992, which was signed into law in October of that year. The U.S. is working to achieve these goals in a number of ways. For instance, the U.S. Department of Energy has undertaken a number of joint efforts with the nuclear industry to develop the next generation of nuclear powerplants. These plants are being designed to be safer and more efficient. There is also an effort under way to make nuclear plants easier to build by standardizing the design and simplifying the licensing requirements, without lessening safety standards. In the area of waste management, engineers are developing new methods and places to store the radioactive waste produced by nuclear plants and other nuclear processes. Their goal is to keep the waste away from the environment and people for very long periods of time. Scientists are also studying the power of nuclear fusion. Fusion occurs when atoms join — or fuse — rather than split. Fusion is the energy that powers the sun. On earth, the most promising fusion fuel is deuterium, a form of hydrogen. It comes from water and is plentiful. It is also likely to create less radioactive waste than fission. However, scientists are still unable to produce useful amounts of power from fusion and are continuing their research. Nuclear energy is energy in the nucleus (core) of an atom. Atoms are tiny particles that make up every object in the universe. There is enormous energy in the bonds that hold atoms together. Nuclear energy can be used to make electricity. But first the energy must be released. It can be released from atoms in two ways: nuclear fusion and nuclear fission. In nuclear fusion, energy is released when atoms are combined or fused together to form a larger atom. This is how the sun produces energy. In nuclear fission, atoms are split apart to form smaller atoms, releasing energy. Nuclear power plants use nuclear fission to produce electricity. Nuclear power plants are very clean and efficient to operate. However, nuclear power plants have some major environmental risks. Nuclear power plants produce radioactive gases. These gases are to be contained in the operation of the plant. If these gases are released into the air, major health risks can occur. Nuclear plants use uranium as a fuel to produce power. The mining and handling of uranium is very risky and radiation leaks can occur. The third concern of nuclear power is the permanent storage of spent radioactive fuel. This fuel is toxic for centuries, handling and disposal is an ongoing environmental issue. An atom consists of an extremely small, positively charged nucleus surrounded by a cloud of negatively charged electrons. Although typically the nucleus is less than one ten-thousandth the size of the atom, the nucleus contains more than 99.9% of the mass of the atom! Nuclei consist of positively charged protons and electrically neutral neutrons held together by the so-called strong or nuclear force. This force is much stronger than the familiar electrostatic force that binds the electrons to the nucleus, but its range is limited to distances on the order of a few x10-15 meters. The number of protons in the nucleus, Z, is called the atomic number. This determines what chemical element the atom is. The number of neutrons in the nucleus is denoted by N. Theatomic mass of the nucleus, A, is equal to Z + N. A given element can have many different isotopes, which differ from one another by the number of neutrons contained in the nuclei. In a neutral atom, the number of electrons orbiting the nucleus equals the number of protons in the nucleus. Since the electric charges of the proton and the electron are +1 and -1 respectively (in units of the proton charge), the net charge of the atom is zero. At present, there are 112 known elements which range from the lightest, hydrogen, to the recently discovered and yet to-be-named element 112. All of the elements heavier than uranium are man made. Among the elements are approximately 270 stable isotopes, and more than 2000 unstable isotopes. 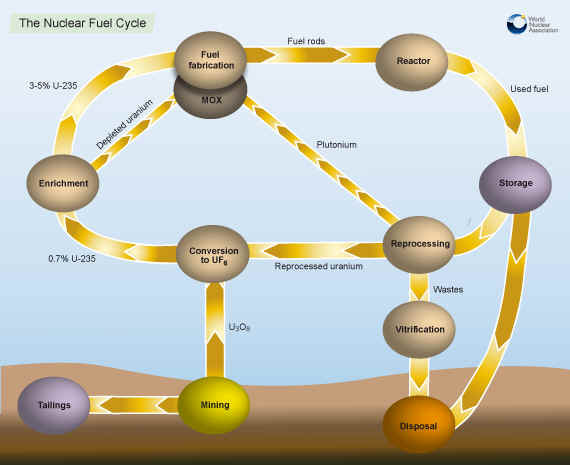 The nuclear fuel cycle consists of "front end" steps that lead to the preparation of uranium for use as fuel for reactor operation and "back end" steps that are necessary to safely manage, prepare, and dispose of the highly radioactive spent nuclear fuel. Exploration. A deposit of uranium, discovered by geophysical techniques, is evaluated and sampled to determine the amounts of uranium materials that are extractable at specified costs from the deposit. Uranium reserves are the amounts of ore that are estimated to be recoverable at stated costs. Mining. Uranium ore can be extracted through conventional mining in open pit and underground methods similar to those used for mining other metals. In situ leach mining methods also are used to mine uranium in the United States. In this technology, uranium is leached from the in-place ore through an array of regularly spaced wells and is then recovered from the leach solution at a surface plant. Uranium ores in the United States typically range from about 0.05 to 0.3 percent uranium oxide (U3O8). Some uranium deposits developed in other countries are of higher grade and are also larger than deposits mined in the United States. Uranium is also present in very low grade amounts (50 to 200 parts per million) in some domestic phosphate-bearing deposits of marine origin. Because very large quantities of phosphate-bearing rock are mined for the production of wet-process phosphoric acid used in high analysis fertilizers and other phosphate chemicals, at some phosphate processing plants the uranium, although present in very low concentrations, can be economically recovered from the process stream. Milling. Mined uranium ores normally are processed by grinding the ore materials to a uniform particle size and then treating the ore to extract the uranium by chemical leaching. The milling process commonly yields dry powder-form material consisting of natural uranium, "yellowcake," which is sold on the uranium market as U3O8. Uranium conversion. Milled uranium oxide, U3O8, must be converted to uranium hexafluoride, UF6, which is the form required by most commercial uranium enrichment facilities currently in use. A solid at room temperature, UF6 can be changed to a gaseous form at moderately higher temperatures. The UF6 conversion product contains only natural, not enriched, uranium. Enrichment. 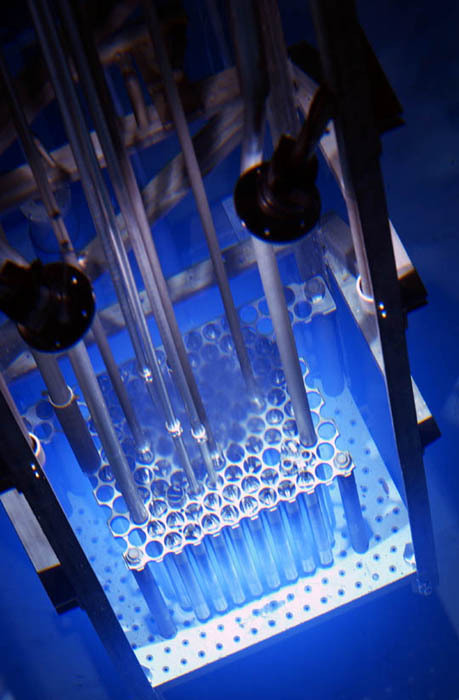 The concentration of the fissionable isotope, 235U (0.71 percent in natural uranium) is less than that required to sustain a nuclear chain reaction in light water reactor cores. Natural UF6 thus must be "enriched" in the fissionable isotope for it to be used as nuclear fuel. The different levels of enrichment required for a particular nuclear fuel application are specified by the customer: light-water reactor fuel normally is enriched up to about 4 percent 235U, but uranium enriched to lower concentrations also is required. Gaseous diffusion and gas centrifuge are the commonly used uranium enrichment technologies. The gaseous diffusion process consists of passing the natural UF6 gas feed under high pressure through a series of diffusion barriers (semiporous membranes) that permit passage of the lighter 235UF6 atoms at a faster rate than the heavier 238UF6 atoms. This differential treatment, applied across a large number of diffusion "stages," progressively raises the product stream concentration of 235U relative to 238U. In the gaseous diffusion technology, the separation achieved per diffusion stage is relatively low, and a large number of stages is required to achieve the desired level of isotope enrichment. Because this technology requires a large capital outlay for facilities and it consumes large amounts of electrical energy, it is relatively cost intensive. In the gas centrifuge process, the natural UF6 gas is spun at high speed in a series of cylinders. This acts to separate the 235UF6 and 238UF6 atoms based on their slightly different atomic masses. Gas centrifuge technology involves relatively high capital costs for the specialized equipment required, but its power costs are below those for the gaseous diffusion technology. New enrichment technologies currently being developed are the atomic vapor laser isotope separation (AVLIS) and the molecular laser isotope separation (MLIS). Each laser-based enrichment process can achieve higher initial enrichment (isotope separation) factors than the diffusion or centrifuge processes can achieve. Both AVLIS and MLIS will be capable of operating at high material throughput rates. Fabrication. For use as nuclear fuel, enriched UF6 is converted into uranium dioxide (UO2) powder which is then processed into pellet form. The pellets are then fired in a high temperature sintering furnace to create hard, ceramic pellets of enriched uranium. The cylindrical pellets then undergo a grinding process to achieve a uniform pellet size. The pellets are stacked, according to each nuclear core's design specifications, into tubes of corrosion-resistant metal alloy. The tubes are sealed to contain the fuel pellets: these tubes are called fuel rods. The finished fuel rods are grouped in special fuel assemblies that are then used to build up the nuclear fuel core of a power reactor. Interim Storage. After its operating cycle, the reactor is shut down for refueling. The fuel discharged at that time (spent fuel) is stored either at the reactor site or, potentially, in a common facility away from reactor sites. If on-site pool storage capacity is exceeded, it may be desirable to store aged fuel in modular dry storage facilities known as Independent Spent Fuel Storage Installations (ISFSI) at the reactor site or at a facility away from the site. The spent fuel rods are usually stored in water, which provides both cooling (the spent fuel continues to generate heat as a result of residual radioactive decay) and shielding (to protect the environment from residual ionizing radiation). Reprocessing. Spent fuel discharged from light-water reactors contains appreciable quantities of fissile (U-235, Pu-239), fertile (U-238), and other radioactive materials. These fissile and fertile materials can be chemically separated and recovered from the spent fuel. The recovered uranium and plutonium can, if economic and institutional conditions permit, be recycled for use as nuclear fuel. Currently, plants in Europe are reprocessing spent fuel from utilities in Europe and Japan. Inside the reactor of an atomic power plant, uranium atoms are split apart in a controlled chain reaction. In a chain reaction, particles released by the splitting of the atom go off and strike other uranium atoms splitting those. Those particles given off split still other atoms in a chain reaction. In nuclear power plants, control rods are used to keep the splitting regulated so it doesn't go too fast. If the reaction is not controlled, you could have an atomic bomb. But in atomic bombs, almost pure pieces of the element Uranium-235 or Plutonium, of a precise mass and shape, must be brought together and held together, with great force. These conditions are not present in a nuclear reactor. The reaction also creates radioactive material. This material could hurt people if released, so it is kept in a solid form. This chain reaction gives off heat energy. This heat energy is used to boil water in the core of the reactor. So, instead of burning a fuel, nuclear power plants use the chain reaction of atoms splitting to change the energy of atoms into heat energy. This water from around the nuclear core is sent to another section of the power plant. Here it heats another set of pipes filled with water to make steam. The steam in this second set of pipes powers a turbine to generate electricity. Fission is a nuclear process in which a heavy nucleus splits into two smaller nuclei. An example of a fission reaction that was used in the first atomic bomb and is still used in nuclear reactors is. An atom's nucleus can be split apart. When this is done, a tremendous amount of energy is released. The energy is both heat and light energy. This energy, when let out slowly, can be harnessed to generate electricity. When it is let out all at once, it makes a tremendous explosion in an atomic bomb. The word fission means to split apart. The products shown in the above equation are only one set of many possible product nuclei. Fission reactions can produce any combination of lighter nuclei so long as the number of protons and neutrons in the products sum up to those in the initial fissioning nucleus. As with fusion, a great amount of energy can be released in fission because for heavy nuclei, the summed masses of the lighter product nuclei is less than the mass of the fissioning nucleus. Fission occurs because of the electrostatic repulsion created by the large number of positively charged protons contained in a heavy nucleus. Two smaller nuclei have less internal electrostatic repulsion than one larger nucleus. So, once the larger nucleus can overcome the strong nuclear force which holds it together, it can fission. Fission can be seen as a "tug-of-war" between the strong attractive nuclear force and the repulsive electrostatic force. In fission reactions, electrostatic repulsion wins. Fission is a process that has been occurring in the universe for billions of years. As mentioned above, we have not only used fission to produce energy for nuclear bombs, but we also use fission peacefully everyday to produce energy in nuclear power plants. The fuel – the fissile material (U-235), either as found in natural uranium or enriched. In some cases plutonium is added. The fuel is produced in the form of metal or oxide pellets. Fuel cladding – a metal shell in which the fuel pellets are contained. It protects the fuel from corrosion and prevents fission products from escaping. A moderator – made of light elements, it slows down the fission neutrons to thermal levels without unduly absorbing them. A coolant – to transport the heat generated from the core to the steam generator for driving the turbine. Control rods – made of neutron absorbing material, these can be moved in or out of the core to control the reaction and maintain it at a critical level or to stop the reaction during shutdown. A pressure vessel – to prevent radioactive material from escaping in case of excessive internal pressure. A containment structure or neutron shield – (concrete or other material) to protect operators and the public from radiation. Another form of nuclear energy is called fusion. Fusion means joining smaller nuclei (the plural of nucleus) to make a larger nucleus. This reaction liberates an amount of energy more than a million times greater than one gets from a typical chemical reaction. Such a large amount of energy is released in fusion reactions because when two light nuclei fuse, the sum of the masses of the product nuclei is less than the sum of the masses of the initial fusing nuclei. Once again, Einstein's equation, E=mc2, explains that the mass that is lost it converted into energy carried away by the fusion products. Even though fusion n is an energetically favorable reaction for light nuclei, it does not occur under standard conditions here on Earth because of the large energy investment that is required. Because the reacting nuclei are both positively charged, there is a large electrostatic repulsion between them as they come together. Only when they are squeezed very close to one another do they feel the strong nuclear force, which can overcome the electrostatic repulsion and cause them to fuse. Fusion reactions have been going on for billions of years in our universe. In fact, nuclear fusion reactions are responsible for the energy output of most stars, including our own Sun. Scientists on Earth have been able to produce fusion reactions for only about the last sixty years. At first, there were small scale studies in which only a few fusion reactions actually occurred. However, these first experiments later lead to the development of thermonuclear fusion weapons (hydrogen bombs). Fusion is the process that takes place in stars like our Sun. Whenever we feel the warmth of the Sun and see by its light, we are observing the products of fusion. We know that all life on Earth exists because the light generated by the Sun produces food and warms our planet. Therefore, we can say that fusion is the basis for our life. When a star is formed, it initially consists of hydrogen and helium created in the Big Bang, the process that created our universe. Hydrogen isotopes collide in a star and fuse forming a helium nucleus. Later, the helium nuclei collide and form heavier elements. Fusion is a nuclear reaction in which nuclei combine to form a heavier nucleus. It is the basic reaction which drives the Sun. Lighter elements fuse and form heavier elements. These reactions continue until the nuclei reach iron (around mass sixty), the nucleus with the most binding energy. When a nucleus reaches mass sixty, no more fusion occurs in a star because it is energetically unfavorable to produce higher masses. Once a star has converted a large fraction of its core's mass to iron, it has almost reached the end of its life. The fusion chain cannot continue so its fuel is reduced. Some stars keep shrinking until they become a cooling ember made up of iron. However, if a star is sufficiently massive, a tremendous, violent, brilliant explosion can happen. A star will suddenly expand and produce, in a very short time, more energy than our Sun will produce in a lifetime. When this happens, we say that a star has become a supernova. While a star is in the supernova phase, many important reactions occur. The nuclei are accelerated to much higher velocities than can occur in a fusing star. With the added energy caused by their speed, nuclei can fuse and produce elements higher in mass than iron. The extra energy in the explosion is necessary to over come the energy barrier of a higher mass element. Elements such as lead, gold, and silver found on Earth were once the debris of a supernova explosion. The element iron that we find all through the Earth and in its center is directly derived from both super novae and dead stars. BWRs actually boil the water. In both types, water is converted to steam, and then recycled back into water by a part called the condenser, to be used again in the heat process. Since radioactive materials can be dangerous, nuclear power plants have many safety systems to protect workers, the public, and the environment. These safety systems include shutting the reactor down quickly and stopping the fission process, systems to cool the reactor down and carry heat away from it, and barriers to contain the radioactivity and prevent it from escaping into the environment. Radioactive materials, if not used properly, can damage human cells or even cause cancer over long periods of time. 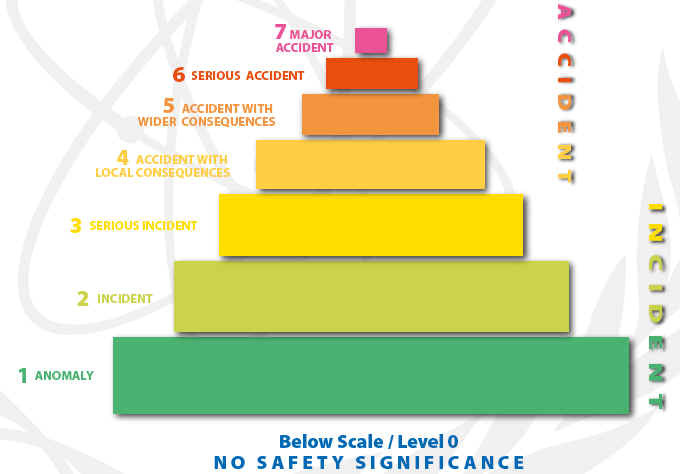 Events are classified on the scale at seven levels: Levels 1–3 are called "incidents" and Levels 4–7 "accidents". The scale is designed so that the severity of an event is about ten times greater for each increase in level on the scale. 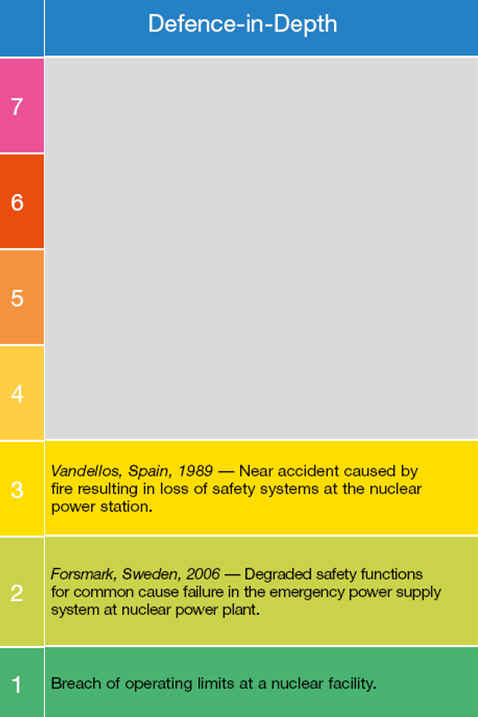 Events without safety significance are called “deviations” and are classified Below Scale / Level 0. People and the Environment considers the radiation doses to people close to the location of the event and the widespread, unplanned release of radioactive material from an installation. Radiological Barriers and Control covers events without any direct impact on people or the environment and only applies inside major facilities. It covers unplanned high radiation levels and spread of significant quantities of radioactive materials confined within the installation. Defence-in-Depth also covers events without any direct impact on people or the environment, but for which the range of measures put in place to prevent accidents did not function as intended.